Hathaway Brown School was pleased to welcome Rick Shenkman as the second speaker in the 2008 Learning for Life Speakers' Series. 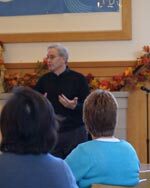 A bestselling author of six history books, Shenkman met with parents on October 20. He followed that presentation by addressing Upper School faculty and students in assembly. Shenkman's most recent book, "Just How Stupid Are We? Facing the Truth About the American Voter," provided much fodder for discussion. As the nation is involved in an historic - and seemingly neverending - political campaign, his presentations were certainly well-timed and understandably weel received. The 2008 Learning for Life Speakers' Series is designed to address this year's School theme: Civics & Civility. It is sponsored by Hathaway Brown School and the Hathaway Brown Parent Association.